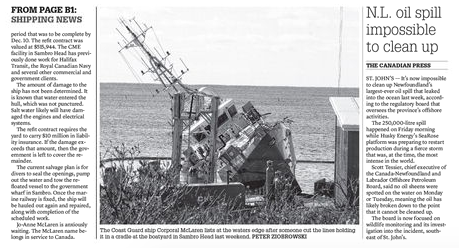 this week in the Herald, I talk about the act of Piracy that put the CCGS Corporal McLearn MMV in the water, and the effect this has had on the ships namesakes family. The CME Shipyard has lax security. The yard appears to have cameras, but isn’t surrounded by fence. Given the timelines, it appears the yard did not have a security guard on site 24/7 despite being required too by the statement of work issued by the government. CME said that the ship was fine at midnight, but was in the water at the next check. We don’t know the time of that check, however the police stated in a release they received the call at 9:05am. This entry was posted in Herald Column on November 21, 2018 by Peter.